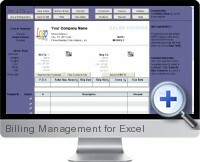 Microsoft Excel provides the tools needed to complete billing tasks such as calculating and formatting invoices. The billing management system for Excel has been developed so that a billing application does not need to be built from scratch. Instead, the functionality of Microsoft Excel is employed to create a customizable billing invoice with storage capabilities. Billing Management for Excel seamlessly integrates with Microsoft Excel, providing a new way to manage customers, products, invoices and payments with ease. With billing management system for Excel is not an isolated invoicing application that can't utilize any existing functionality, but a feature added to Microsoft Excel, or a special Excel customized for invoicing. All Microsoft Excel features are available, from simple formatting, such as replacing default fonts and colors, moving and merging cells, to more advanced reporting and charting. Simple and Easy to Use - Working within a true 'What You See Is What You Get' invoice template, most common functionality is just one click away. Highly Customizable - As Billing Management for Excel is based on Excel templates, this offers the most flexible way for invoicing.